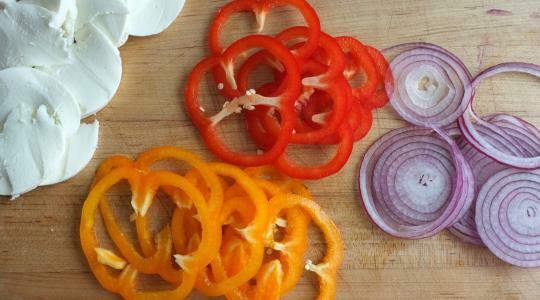 Other toppings: thinly sliced bell peppers, red onion, mushrooms, olives, etc. Heat the oven (with the oven rack in the lowest position) to as high as it can go. If you have a pizza stone, great, use it. If, like us, you don’t, lightly oil the back of a large sheet pan. 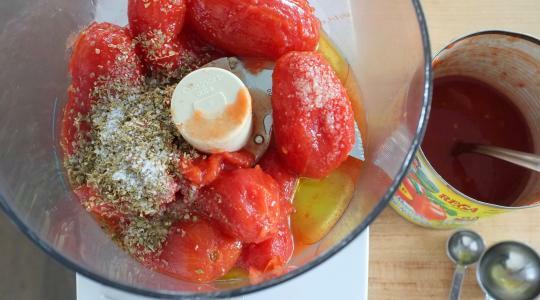 Make the sauce: Scoop out the tomatoes from the can into a food processor (saving the liquid in the can for another use). Add the oregano, salt, and oil. Using a microplane or the small holes on a cheese grater, grate in the garlic. Puree until smooth. For the pizza, if you want one type of pizza, gently flatten and stretch the dough over the back of the pan. 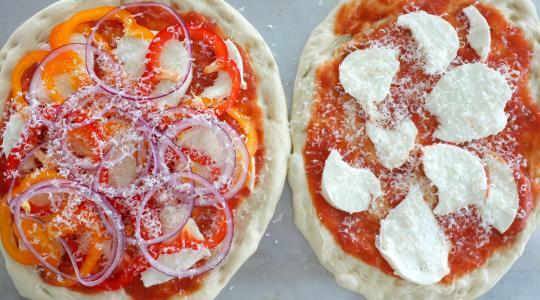 If you want 2 types of pizza, first cut the dough in half. 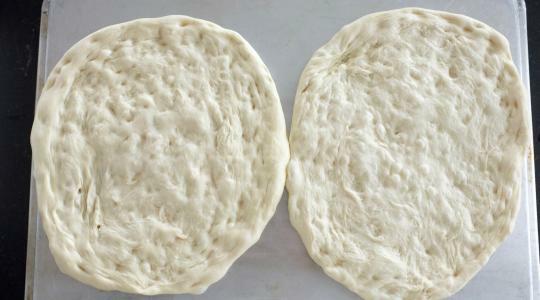 Gently flatten each piece of dough with your fingertips. Then stretch it evenly, starting at the edges, until it’s 8 to 10 inches in diameter. You can pick the dough up and gently pull at the edges while rotating to help stretch it. It should be thin but not see-through. If the dough refuses to stretch, let it rest for 10 minutes to relax the glutens. It’s okay if they are a little wonky and not perfect circles. 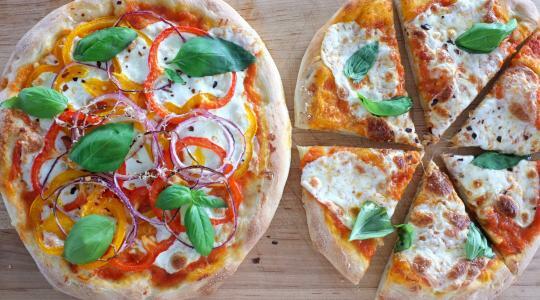 Spread a thin layer of the sauce over each pizza, leaving a one inch border around the edges. You will have extra sauce – refrigerate or freeze it. Slice the mozzarella and arrange over the sauce. Add more toppings if you like. Sprinkle Parmesan over the pizza(s). Bake 15 to 18 minutes, until the crust is golden brown and crisp. Slide the pizzas onto a cutting board. Top with the basil and crushed red pepper. Slice and serve.